The Awakening is an American novel published in 1899 in which the author, Kate Chopin, demands independence for women at a time when they were obliged to be both mothers and wives. Edna Pontellier is a 29-year, high-class old Southern beauty with a perfect life that even includes a couple of houses in which she can have a break from her stressful life. But, while vacationing in Le Grand Isle with her fellow creole neighbours, she makes friends with the hotel’s owner’s son, Robert Lebrun. Although at the beginning Edna is not conscious about the real meaning of their relationship, it is when Robert decides to move to Mexico that she falls into a light depression that moves her away from society and the role she is supposed to play. Obviously, her friends, specially Mrs. Ratignolle, are aware of Edna’s changes and, being the perfect housewives they are, they cannot help taking care of Edna and her family… even if that implies replacing her. But that is not enough for our heroine who, tired of her life in her New Orleans mansion, decides to change drastically her life, starting by moving to another, smaller house. 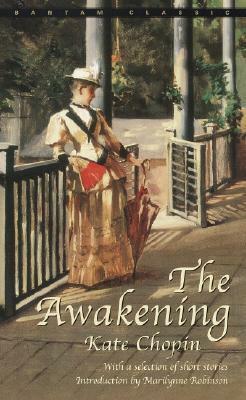 The Awakening is, then, a great novel about the awakening of a woman during the last years of the 19th century by a woman who did not accept the roles the society expected her to play… even when she did not want so. In my opinion, this is one of the best novels I’ve ever read and, although it was banned and highly criticized when published 100 years ago, it deals with a theme still present in our society. In addition, the characters are deep and well constructed: the reader feels true sympathy for Edna and the bitterest hate towards Mrs. Ratignolle while she tries to jail Edna in her own house and roles.